What drives your customer support team? Forward-thinking companies know that a great customer experience relies on the effectiveness and efficiency of their customer support teams. 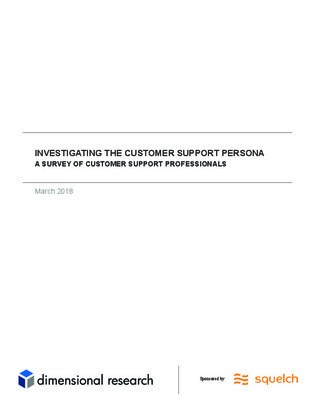 In this customer support research report from a survey by Dimensional Research, get a better understanding of the people and systems at the heart of the customer experience, and get an in-depth look at hard data on their attitudes and experiences. To learn more about the challenges that customer support teams face, and how to improve them, download this report, and get started building your improved customer support strategy.